DVD Synopsis: In 1974, a misguided 19-year-old named Michael Peterson decided he wanted to make a name for himself, and so with a homemade sawn-off shotgun and a head full of dreams, he attempted to rob a post office. Swiftly apprehended and originally sentenced to seven years in jail, Peterson has subsequently been behind bars for 34 years, 30 of which have been spent in solitary confinement. Provocative and stylized, Bronson follows the metamorphosis of Mickey Peterson, who gave himself the nickname Charles Bronson, from a petty thief into Britain's most dangerous prisoner. 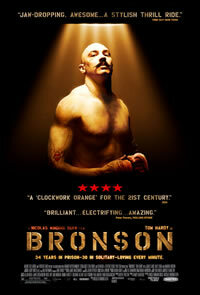 A film that fits neatly into the category of “difficult to watch, but impossible to look away”, Bronson deals with some pretty brutal subject matter (the true story of a criminal whose violent nature has kept him in British prisons for 34 years, 30 of which were spent in solitary confinement), and yet the final result is far from dark and gloomy. I won’t lie; the blood and violence is plentiful, but the film balances that violence with a light, almost bouncy style and is, at times, genuinely funny. Charlie, as played by Tom Hardy, is not a person to be trifled with, yet, acting as both lead character and narrator of his own story, Hardy’s Bronson is always entertaining, and keeps us smiling when, by all rights, we should be horrified. This is material that could have been served just as well by a deep, dark, psychologically-driven approach, but then we wouldn’t have a film nearly as much fun as Bronson, would we? Heard of this but did not know what it was really. I love. Iolent British films. Will check it out. This is such an underrated masterpiece. It's one of Nicolas Winding Refn finest films and the one that made me take notice of his work. It also made me take notice of Tom Hardy. Both artists have a long bright future ahead of them.